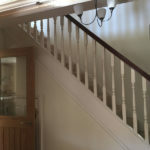 K and M Decorating Services Limited are specialist Painter and Decorators based in Horsham. 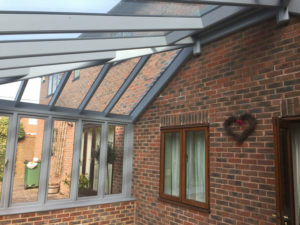 We focus on providing the best job we can for our customers by using quality products and adopting specialist decorating techniques. The key to painting and decorating is the preparation stage where getting a good sound base to work on will pay dividends to a better quality finish. Painting interior rooms can be tricky, depending on the amount of room you have to work with. A key to this is being organised, keeping things clean and having a good level of patience. Rushing a painting project will end up looking just that, rushed. An area of painting that is very vogue at present is having a feature wall. 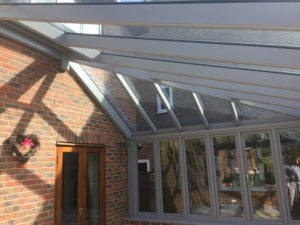 We have dealt with many projects recently that have been quite complex and needing a high level of painting skills and using specialist techniques. A good example of a tricky painting design to get right is a chevron pattern and painted stripes. Below shows both of these and can be mistook for being wallpaper. A painted feature wall can make a real statement to any room. A painted chevron feature wall and a painted wooden paneled cloakroom. 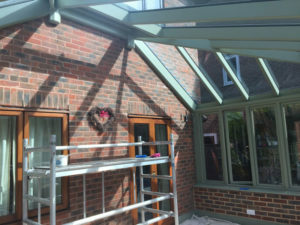 We recently painted the interior of a lovely wooden framed conservatory in Horsham. As it is a wooden frame it regularly needs maintenance every couple of years or so. 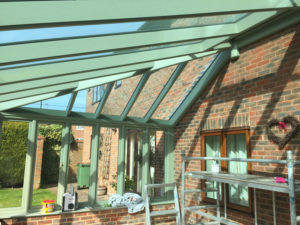 We prepared all the roof bars, windows and sills, the doors and the skirting board for undercoat. We finished off with a topcoat of Dulux natural slate eggshell in a satin finish. 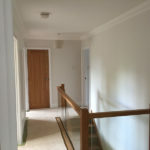 We recently painted the interior of a detached house in Southwater. We used Stain block on the ceiling and coving after a water leak. 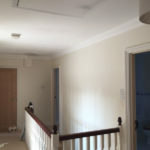 We had to sand and prepare the ceiling and coving for 2 coats of Dulux white emulsion. We also prepared and filled all walls for 2 coats of Khaki mist Dulux emulsion. More details can be found in case study page. 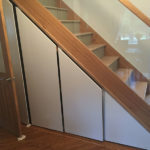 If you have any decorating, wallpapering or mural projects you would like us to give a free quote for please call us on 01403 734083 or use our contact form.